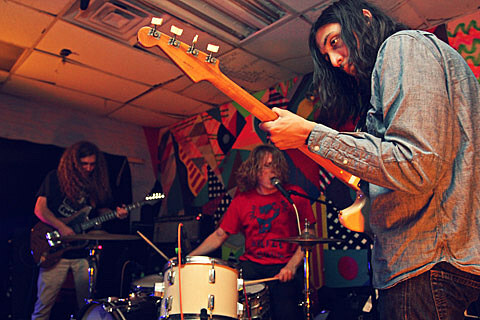 While Ty Segall has a new solo album/tour in August, for the moment he seems to be enjoying playing drums in his other band, the proto-metal leaning trio Fuzz. Following their debut single on Trouble in Mind and a recent tour (where they tore up Death by Audio), Fuzz have just announced their self-titled debut will be out October 1 via In the Red. You can download “Loose Sutres” from the album above, or stream it below. The LP’s proggy cover art and tracklist are below too. After his solo tour in August, Ty will be going out with FUZZ again for a proper North American tour which includes a stop in NYC: October 12 at Mercury Lounge. That and most of the other dates are with CCR Headcleaner, and the Chicago date coincides with The Men and Purling Hiss’ just-announced tour. Tickets to the Mercury Lounge show go on sale Friday (7/12) at noon with an AmEx presale starting Wednesday (7/10) at noon. All tour dates are listed below.